AMD/ATI's first DX10-supporting card is with us. Its pricing, plus our DX9 benchmark tests, place it as a competitor to the 680MB version of the 8800GTS. This is an underwhelming entrance for a card that's well over six months behind the launch of Nvidia's first unified-shader DX10-ready cards. And, what's more, ATI/AMD doesn't even have its mid-range cards ready for launch yet, so there's no current competition for the 8600 and 8500 series of GeForce parts. In the timeless battle for graphics card superiority, this round definitely goes to Nvidia. If you've read the review of the Asus 8800 Ultra , you'll know that DX10, like so many other elements of Vista, is still embryonic; even the top-shelf graphics cards struggle to put out reasonable performance figures under the new API. So how does the HD 2900 XT - a high-end card according to ATI, but merely mid-range as far as Nvidia is concerned - fare in this environment? Well, considerably better than expected. While the 8800 Ultra can't quite make 30fps in Company of Heroes at 1600 x 1200 with no anti-aliasing applied, the HD is actually snapping at its heels, with 28.3fps. Now, assuming (which we are) that this is early days for DX10 and, once driver and API technical issues are worked out, this hints at a real value proposition for ATI's flagship DX10 card. It undercuts the 8800GTX by around £100, the 8800 Ultra by £200, and comes close to matching the performance of the latter. Not that 28.3fps is anything to write home about, but it may mean bright things for future DX10 applications. As far as bankable performance goes today, the HD2900XT has little to recommend it over Nvidia's 640MB 8800GTS. They're available for very similar prices, and offer near identical levels of DX9 performance. 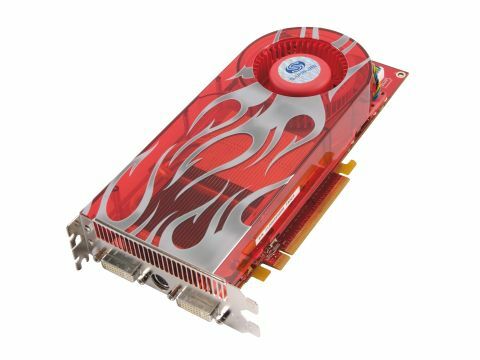 Until the various parties involved in bringing DX10 to market can work together to bring the potential performance of such cards to light, it's best to consider the Sapphire HD 2900 XT as a decent upper- to mid-range DX9 card with average DX10 performance.